The fortified hilltop village Barberino Val d’Elsa lies in the heart of the famous Chianti area, a region in Tuscany stretching between Florence and Siena (both cities are only 1/2 hours drive by car), and in easy reach of Lucca, Pisa, San Gimignano, Volterra and Arezzo, all to be reached in less than one hour by car. 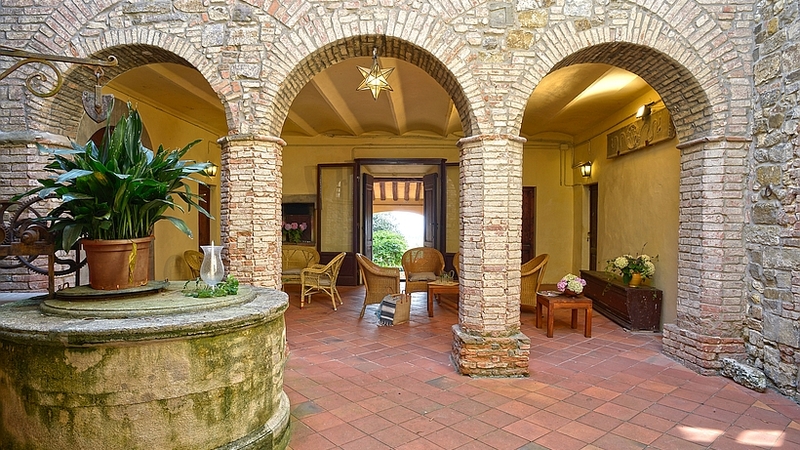 The rental villa Palazzetto is a gentleman’s abode whithin the village walls of Barberino with a beautiful garden at the back of the house opening onto exquisite views of endless rolling hills and the skyline of San Gimignano in the distance. The village of Barberino Val d’Elsa has two bars, a bank, a small shop, an excellent butcher, a restaurant, a wine bar, a hairdresser, a chemistry, a post office and a small supermarket. Barberino in Chianti lies in the heart of the Chianti region, half way between Florence and Siena. The Chianti area: Famous for its wines – the Chianti Classico – this area of Tuscany has more than just world-class oenological pleasures to offer. The curious visitor will come accross many delightful villages, each of them with a history of its own. Let us simply mention lesser known gems such as the romanesque church of Sant’Appiano, the Basilica of Impruneta, the fortified castle of Monteriggioni and the roofless romanesque abbey of San Galgano which are all close. And don’t miss the Saturday market in the small town of Greve. Restaurants: eating out is a way of getting to know the area. Simple local trattorias rub their shoulders with more sophisticated restaurants specialised in refined cuisine. Fresh local produce allways plays the leading role. You will find a list of our favourites in the villas. Local craftsmanship: hand-made terracotta pots from Impruneta, hand painted pottery from Montelupo, mouth-blown crystal glass from the neighbouring village Colle Val d’Elsa, not to mention the south bank of the Arno river in Florence where you will find a multitude of craftsmen working silver, leather, wood, glass, paper and metal. You can explore the Barberino area on horseback, scooters or mountain bikes which can be rented in the village. The local tennis club has 2 well-kept courts which can be booked by the hour.